India is a land of festivals and fairs. Every day of the year there is a festival celebrated in some part of the country. Some festivals welcome the seasons of the year, the harvest, the rains, or the full moon. Others celebrate religious occasions, the birthdays of divine beings, saints and gurus (revered teachers), or the advent of the New Year. 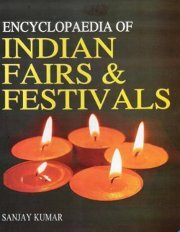 In this handy volume, primarily the attention has been paid to all Pan-Indian festivals, but efforts been also made to cover every leading regional festivities along with select headings on vows, rituals, temples, centres of pilgrimage, holy cities, deities etc. The work caters not only to Hindu celebrations, but also to the festivities of the Buddhist, Jaina and Sikh religions emanated from this land and also Christian. This will be an ideal companion for all who with to have a glimpse of Indian life through its colourful festivals, fairs, rituals, vows, customs, religious and seasonal celebrations.